This past weekend, I attended a wedding for a co-worker and I think this is the first wedding I have been to in about 10 years. It’s funny how the cycle of life happens. When you’re younger, you go to lots of weddings. As you get older, you transition into baby showers, and then first birthday parties. Eventually school graduations… kindergarten, elementary school, middle school, High School, and then College. And I hear the cycle starts over as you attend the weddings of your friends kids. But, we are still a number of years from that. I debated over what to give the happy couple since they’ve been together a number of years already and they have a very small home. I finally settled on making some thank you cards that they could use after the wedding. I used her wedding invitation as a basis for the style of my cards. Her invitation had the Crumb Cake and Very Vanilla card stock base with lace, a pearl, and burlap ribbon. I didn’t have enough of the burlap ribbon on hand so I swapped it out for the linen thread, which I think is actually a better size for the smaller Notecard set. The Notecard sets are perfect for gifts like this. You get 20 Notecards and envelopes in the package and they are slightly smaller than our standard card size. The pearls were the very last step on the card. They are self adhesive, but I reinforced them with a bit of the fine-tip glue since they didn’t stick to the linen thread very well. Here’s what they looked like all laid out drying. I made the card for the gift very similar to the thank you notecards. I don’t have a lot of wedding-ish stamps but I think the “sending wishes” is a pretty good alternative. Here is the inside of the card. I wanted to make it a little more special than just a simple congratulations stamp. I hope they like the thank you notecards. I think this is the perfect wedding gift for a couple that really doesn’t need anything or have the space for things. This is the last week for Fall Into Savings Paper Pumpkin promotion! If you sign up by September 10th, your September kit will be half off. Sign up using promo code HALFOFF0917 at paperpumpkin.com by September 10. The 50% discount only applies to the new subscriber’s first kit. After that, the price for each month’s kit will return to the regular price of $19.95 USD. Click the link on the left to go to my Paper Pumpkin subscription page and sign up now. Hosting a holiday catalog event is always fun—and we’ve just sweetened the deal with our exciting Merry Patterns Host Promotion. 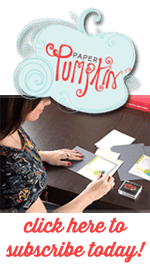 If you host a party with $300 in sales by October 31, you’ll earn the FREE Merry Patterns Stamp Set.